My only true love is gone. I only wish he knew how much I loved him. The Long Return is the second book in the series, The Returned Lords of Grosvenor Square. Welcome to the exciting world of Regency London! Jacob and Arabella use to play as children they grew up together as best friends. When he was old enough to have his season he asked Arabella is she would marry him. She thought he was teasing her and she laughed. He left and went to war. She received word that he was killed and she was heartbroken. Her mum gave her six months to grieve her loss. Wonderful story. I truly enjoyed reading this book. Can’t spoil this for you. I was given a copy of this book for my honest review. Arabella and Jacob had been friends since childhood and when he asked her to marry him she though it was one of his usual jokes but he was serious. He was so hurt by her disbelieving him he left to join the army. It was only afterwards that she realised her had been serious it was too late to stop him. After eight months of not hearing from him her mother pushes her to find a husband. She loves Jacob so much that she doesn’t want to look at anyone else until they get a message that he had been killed. She eventually becomes engaged to a man her mother wants her to wed. Then Jacob comes home. Can they rekindle their relationship? How will she get out of the engagement? This is an excellent story with heroes and villains included. There is romance, intrigue and action. This is a sweet clean romance which I really enjoyed. 5.0 out of 5 starsTrue love! Sigh!!! Sad to finish book! Jacob declares his love and proposals to Arabella. Thinking he is joking she refuses him. Angry and broken hearted he leaves for war. Declared dead Arabella is broken hearted and is pushed into a marriage not of her choosing. The book is well written and captures the characters emotions and motivations; and as a reader brought into their world. Highly recommended!! Arabella Marchmont, daughter to the Earl of Blackford, tried hard not to giggle as she ran and hid from Jacob St. Leger, second son the Duke of Crestwick, in their game. No matter where she hid, he always found her. It didn’t look like that would ever change. When they were grown up, Jacob’s father wanted him to go to London for the Season and consider his future. He found Arabella in the library, hiding out from a man she was supposed to entertain but instead claimed a headache to hide out in the library. Jacob told her he had been thinking seriously, and he wanted his future to be with her. She was convinced he was teasing her and said it was in poor taste! She left the room, waiting for him to laughingly follow and confess… but he didn’t. She didn’t even turn around to see the hurt look on his face as she walked away. Every day, Arabella re-read the letter Jacob sent to her as he left to serve in the army, the letter explaining he had meant every word of the proposal. He had loved her always and his heart was broken. She wrote him immediately, but it was too late. So now, every day she asked the maid if a letter had arrived from him. He had been gone for 8 months and she never knew if he would come back to her. With her two sisters betrothed, Arabella left the room when the talk turned to their weddings. Her mother hurried out after her and told her that she now needed to find a husband too! She said it was up to Arabella to marry a man of title and wealth and she was not to wait around for Jacob any longer -- he probably wouldn’t even be interested in her after she rejected him anyway! Arabella firmly insisted that she would wait for Jacob! As she turned to walk away, a maid ran to her with a letter in her hand! But it was not a message of joy or hope – Jacob had been killed! Although her mother let her grieve in peace for 6 months, at Martha’s wedding she was informed that she had to begin meeting gentlemen again. Finally her mother told her The Earl of Winchester wanted to meet her. As they talked, he mentioned her going to London for the Season, as her mother had told him – and he asked to call upon her and get to know her better! Jacob finally arrived in England, having received word of his brother’s illness and death while he was recovering from his own wounds from the battle. He now had to prepare to become the next Duke of Crestwick when the proper time came. He would have to marry immediately and produce an heir – his mother probably had the ladies already lined up for him. Arabella’s mother continued to encourage a relationship for Arabella with The Earl of Winchester, despite the fact that Arabella had no interest at all. But with no hope for a life with Jacob now, feeling guilty that her rejection sent him to war and to his death, maybe it didn’t matter that she would never care for a husband. As her mother sneaked out of the room, the Earl announced she was suitable for him as his wife – no talk of love, no joy in his eyes – as her mother rushed back in the room and said YES, her daughter would accept! Neither noticed that Arabella was speechless and said nothing. Soon enough the notice would be in the papers and the news spread all around London. How would Jacob react when he learned of her wedding planned within the month? How would Arabella react if the love of her life showed up alive and still in love with her? This was an amazing story. Through a misunderstanding that an expression of love was meant as a joke between friends, Jacob and Arabella are kept apart. Grab your copy of this emotional story to see if their future is still out of reach and, if not, how can it be saved? 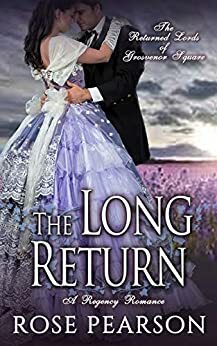 I enjoyed this Regency Romance that kept me entertained and engaged from beginning to end with interesting characters and a story that included lots of drama and emotional romance. I liked the dynamic between Lady Arabella Marchmont and Lord Jacob St Ledger who are given a second chance at romance when he returns home after being reported killed in the war. This is a must-read for fans of this genre and I look forward to reading more by this talented author. I received an advance reader copy of THE LONG RETURN from Booksprout and this is my voluntary review. I bought this book based on the summary, which sounded interesting. It is the first book by this author I have attempted to read and it’s definitely the last. Granted, I did not live during the regency time period, but I still know more about it than this author. During the regency time period marrying for love was the exception, not the rule. Women did not “tell off” gentlemen, especially higher ranking ones. Women did not walk around town unchaperoned. Unmarried women did not call upon unmarried gentleman. These are just the most glaring errors and only the ones in the first half of the book. I couldn’t read anymore. Additionally, the hero of the story seemed to be suffering a personality disorder. Or rather, the author couldn’t decide which personality to give him. Upon return from war, he states he’s “happier than he’s ever been” but just days later he sulking about his leg and claiming to be half a man. One short visit and chat from Arabella and he’s right as rain again. His back and forth personality changes make him seem immature. To sum up, this book is historically inaccurate and lacks convincing characters. I would be more forgiving if it had been billed as a young adult novel. It reads juvenile. What a story! Rose Pearson gives us a powerful tale that starts out with a huge misunderstanding. Jacob is so hurt by it that his father buys his colours and he goes to was. Arabella is upset that he left, but she is devastated when his family receives notice that he has died in battle. This sets the plot for the rest of this touching romance. Ms Pearson has much compassion as she writes this book. At the behest of her overbearing mother she is forced to face life without Jacob. The mother even accepts a proposal for Arabella. Then Jacob suddenly returns, albeit with a damaged leg, but he is alive. in books, this was a tear jerker at times, at least to me. So get your favorite beverage, a box of tissues and a comfortable spot and enjoy. I did. The story started a little predictable, then the situation changed. I could feel the tension build as the hero, facing more than one challenge, struggled with the best way to solve his dilemma. True to the times, he avoided burdening the heroine, which added to the tension. Well-written characters and an interesting plot with interesting secondary characters (I'm glad her mother wasn't mine) contributed to a great read.